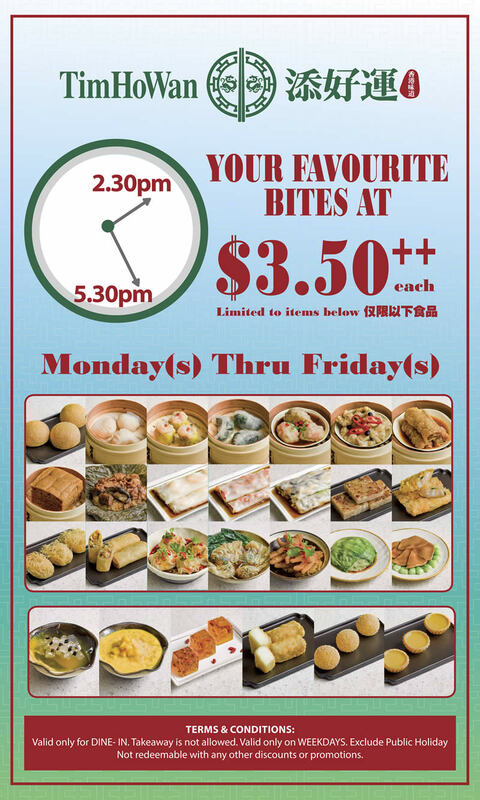 Tim Ho Wan is offering a tea time promotion, with more than 20 dim sum items going for $3.50++ each (Refer to poster below for photos of items). The promotion is on for a limited period from Mondays to Fridays, 2.30pm to 5.30pm. Considering that most of the items offered are priced originally from $4.50 onwards, this is quite a good deal. However, take note that this is valid only for dine-in, at all THW outlets except Pacific Plaza and Plaza Singapura outlets. 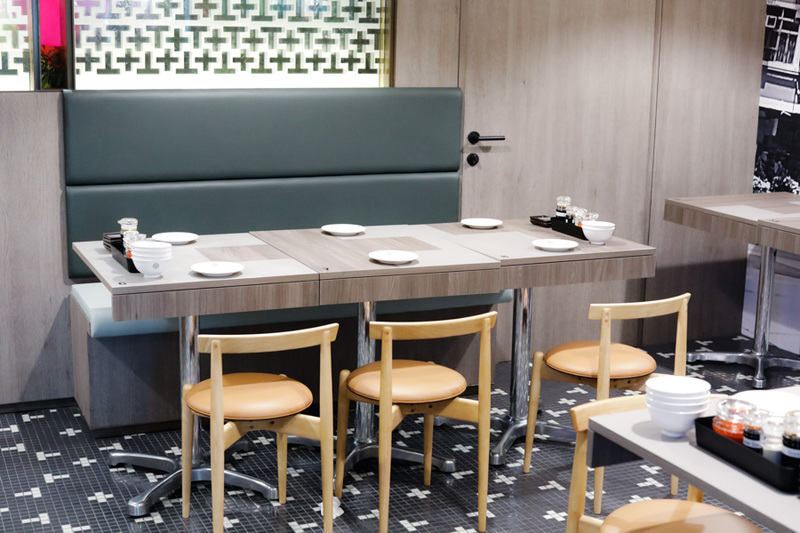 Often known as the “most affordable Michelin-starred restaurant in the world”, Tim Ho Wan has also opened its 9th outlet in Singapore at Great World City. 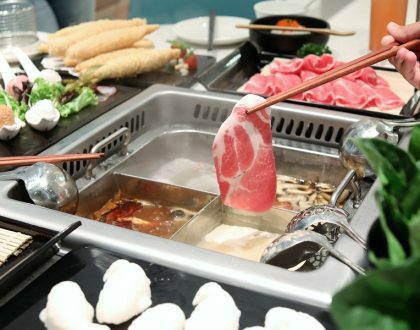 If you have not been to Great World City in a while, the one-stop family mall has revamped its extension with many more dining options – quite worth a re-visit. The new 78-seater dim sum joint is positioned near the West Lobby. 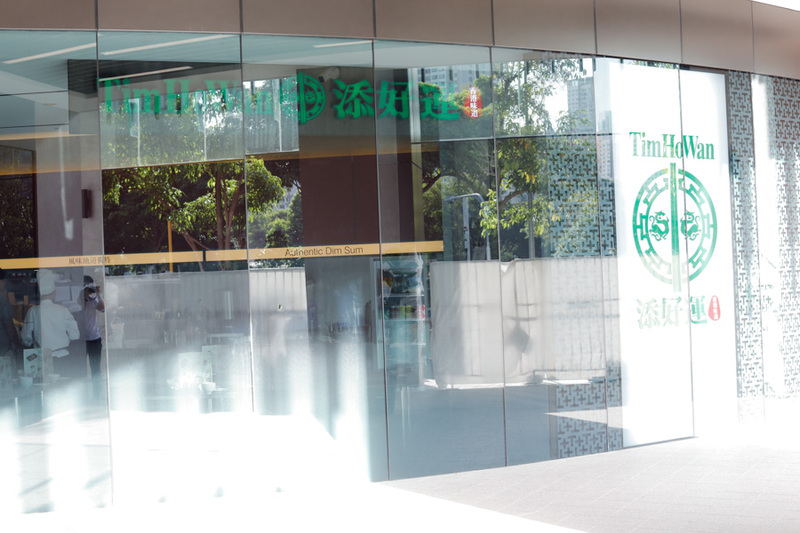 Originally from Hong Kong, dim sum specialist Tim Ho Wan (添好運) earned its first Michelin star via Michelin Guide Hong Kong and Macau 2010 for its store in Mongkok, Kowloon. Its founding chefs Mak Kwai Pui and Leung Fai Keung are from the prestigious three Michelin starred Lung King Keen restaurant in Hong Kong’s Four Seasons Hotel. 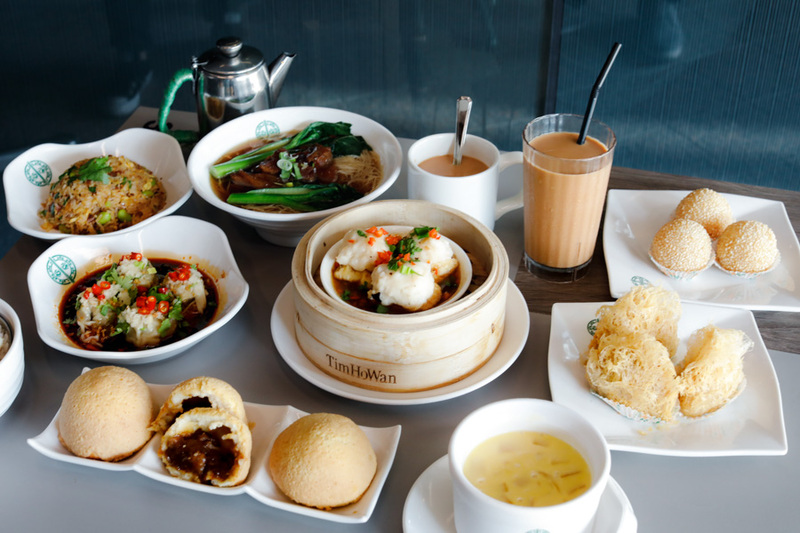 As part of its innovation, Chefs Mak and Leung together with the Tim Ho Wan culinary team, have been tweaking their existing recipes and refining some of its popular dishes to develop a refreshed and updated menu across all its outlets. 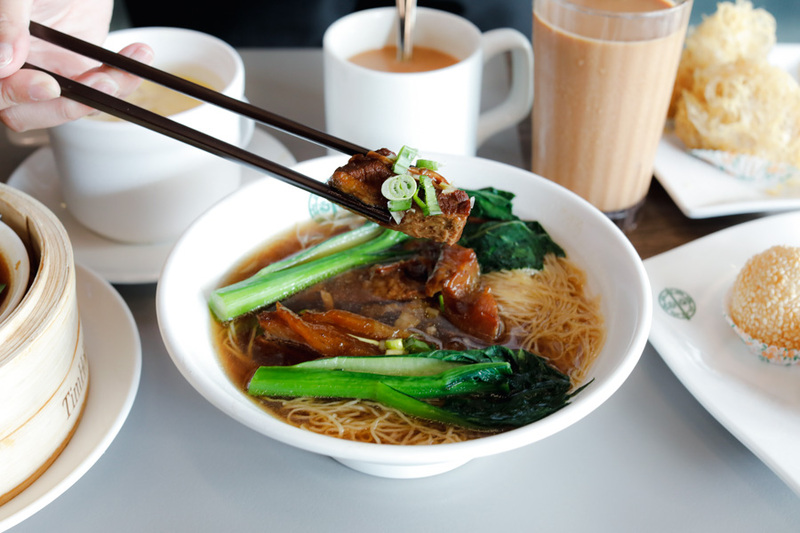 This noodle soup dish may just ‘bring’ you back to Hong Kong. Made with thin and perfectly springy Hong Kong-style noodles, this soup is loaded with Chinese spices and deep beef flavours. 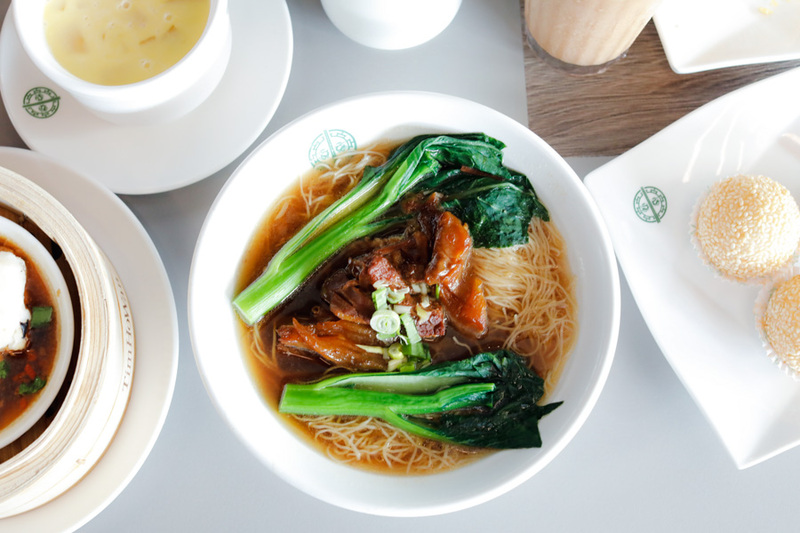 Sharing equal billing with the noodles are the specially-selected chunks of beef and tendons, braised for 3 hours until melt-in-your-mouth tender. 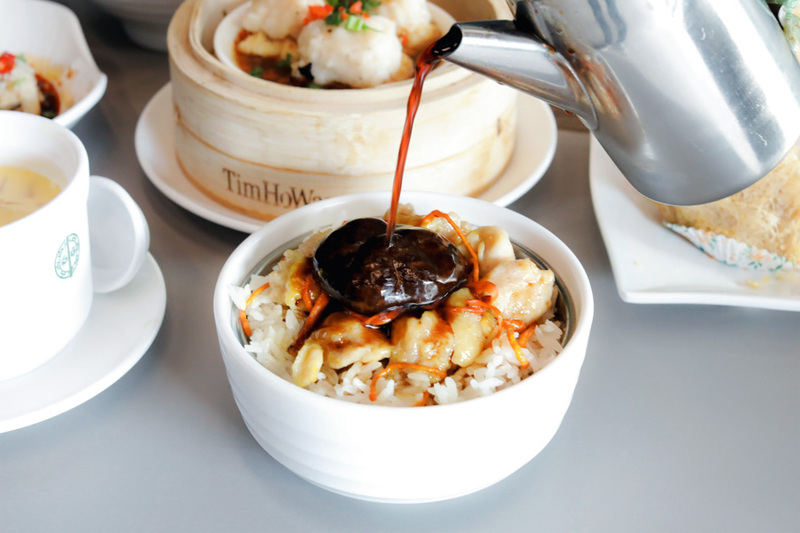 It is the special Tim Ho Wan sauce that adds the X factor to this dish, plus the perfect tendons which took the chefs 2 months to source out. Served with pak choy on the side for a touch a green. Another noodle dish on the menu is the Spicy BBQ Pork Stew Noodles, affordably priced at $6.50. 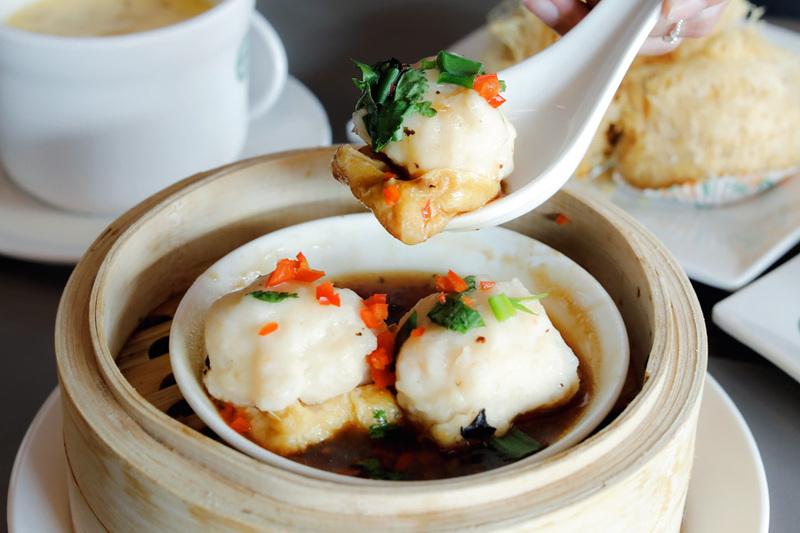 Love your ”Hong You Chao Shou” Bite into these bouncy and chewy pork dumplings, filled with a succulent minced pork filling, and taste that refreshing kick of ginger towards the end. The wonton skin is delicately thin and silky smooth, drizzled with Tim Ho Wan’s red-hot chili oil and a special spicy sauce made with 18 different herbs and spices. Though the spicy sauce is a tad on the sweet side, these dumplings are still a welcome addition to fans of hot & spicy dim sum. It is finished off with a sprinkling of sliced red chilies and fresh coriander leaves. 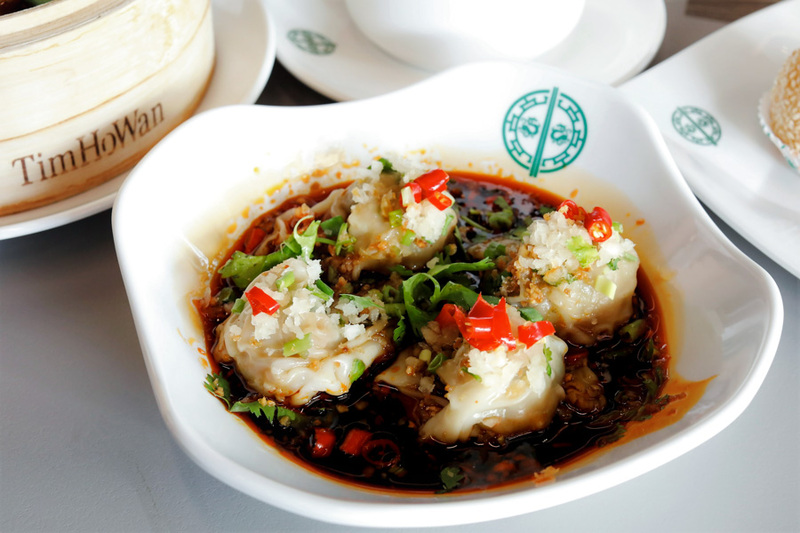 This dim sum’s delectable filling combines naturally sweet plump prawns with a little bit of juicy minced pork. The surprise comes at the bottom, with a piece of beancurd skin fried until crisp (think people know it better as ”tau pok”). 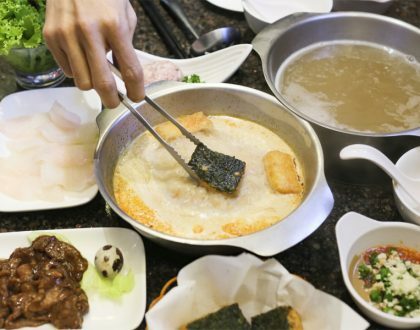 The beancurd skin would be the component that would absorb the savoury sauces below, thus, you would experience two types of textures – bouncy on the top, soft and moist on the bottom. Order this a side dish. Made with grated taro which is blended into a mash, then filled with minced chicken. 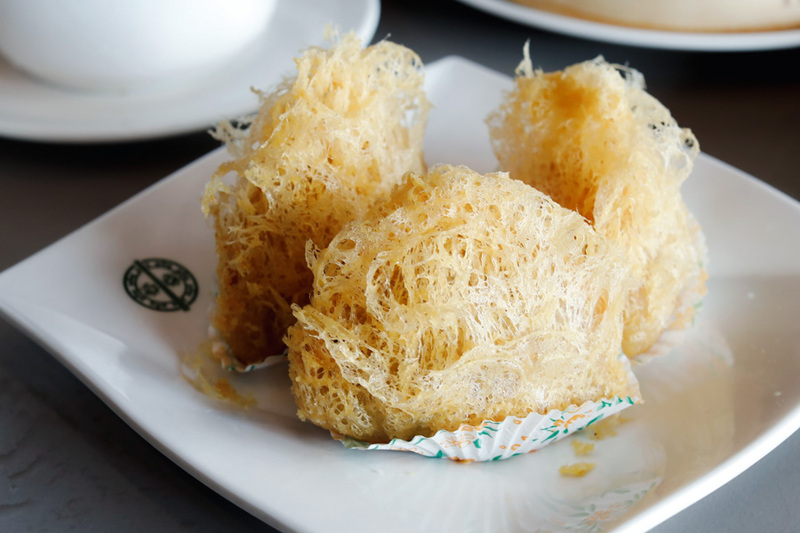 Finally, it is deep-fried in hot oil until it transforms into a dim sum item of crispy exterior contrasted with warm and juicy fillings. This rice dish is stir-fried with the aromatic lap cheong – a red-coloured Chinese sausage made with pork and pork fat marinated in sugar, rice wine, soy sauce and spices. It has been upgraded with the addition of fresh soybeans a.k.a. edamame, an ingredient that imparts an interesting textural crunch to the starchy rice grains, tossed in fresh whisked eggs for more umami goodness. As a final layer of flavour, you get a moderate level of spiciness to whet your appetite. 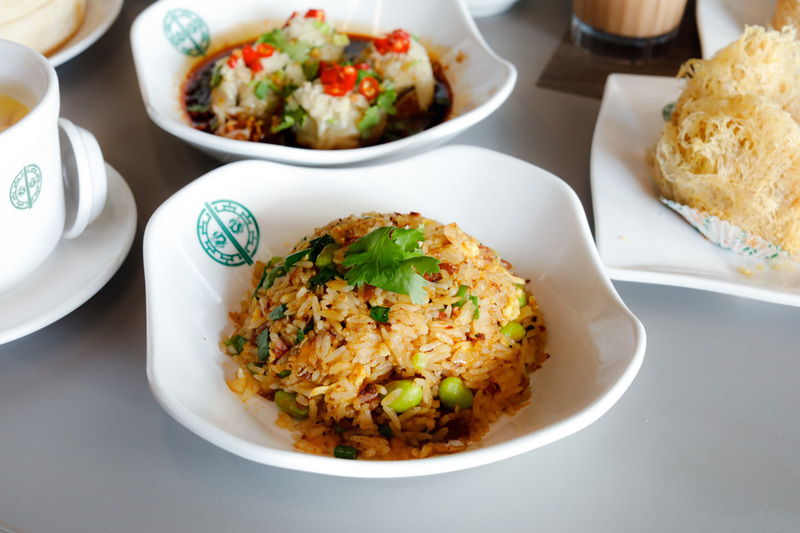 If spiciness is not your thing, there is also the option of Yangzhou Fried Rice ($7.50). Another rice dish in the line-up features tender chunks of chicken meat on top of rice. This is my favourite among the new items. Adding an earthy flavour as well as visual interest is a piece of whole shiitake mushroom in the middle, topped with woody-scented cordycep flowers. This reminds me of the steamed rice that I always order with double-boiled soup. Very comforting. There is also the option of Pork Spare Rib, Yam & Black Bean with Rice ($6.80) which I am inclined to order next time I visit. If you’re a dessert person, you’d probably like this – combining crunch with soft-sweetness. 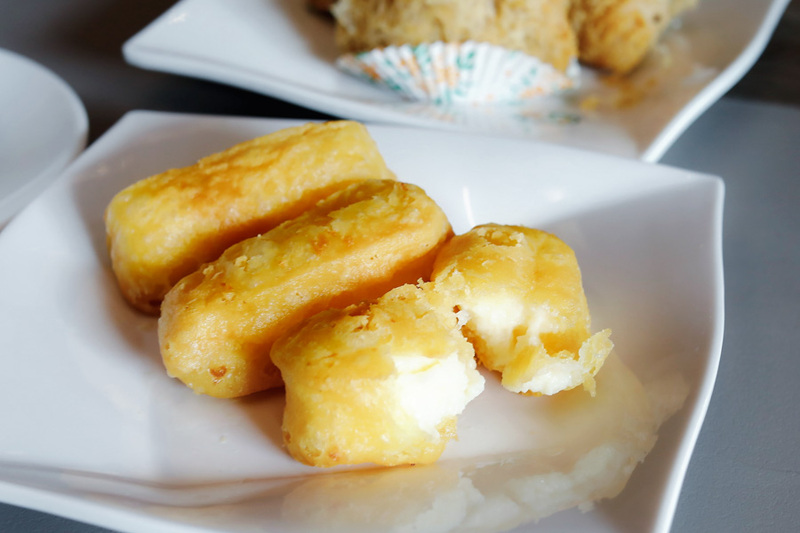 These deep-fried blocks of milk custard (you get 3 pieces in a serving) makes a transition from savoury to sweet. The only thing was I found those a tad oily. 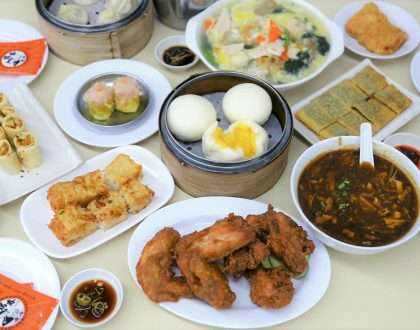 The popularity of the salted egg isn’t ready to subside yet and now it found its way as a savoury filling into dim sum. Be ready for a burst of flavour. 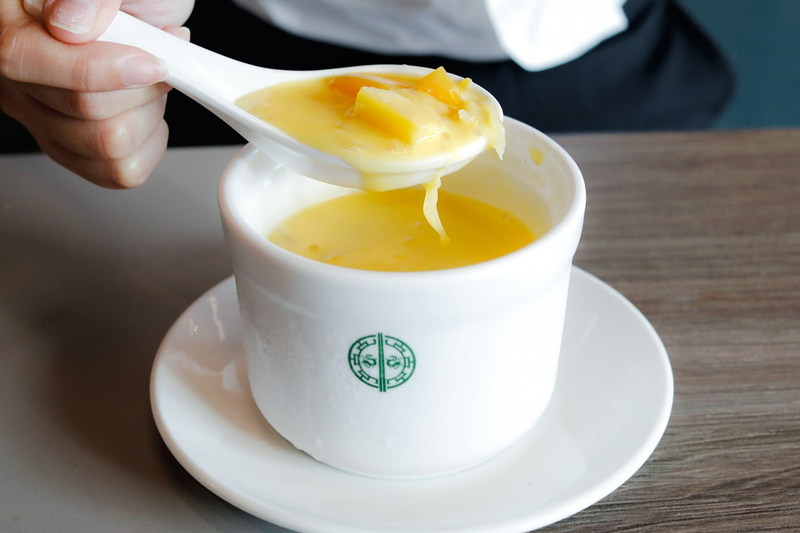 A refreshing bowl of familar sweet chilled dessert of ”Yang Zhi Gan Lu”, of diced ripe mangoes, some fruity pulps of pomelo, and creamy coconutty base. I was pretty surprised this was a “New” item, but better late than never. 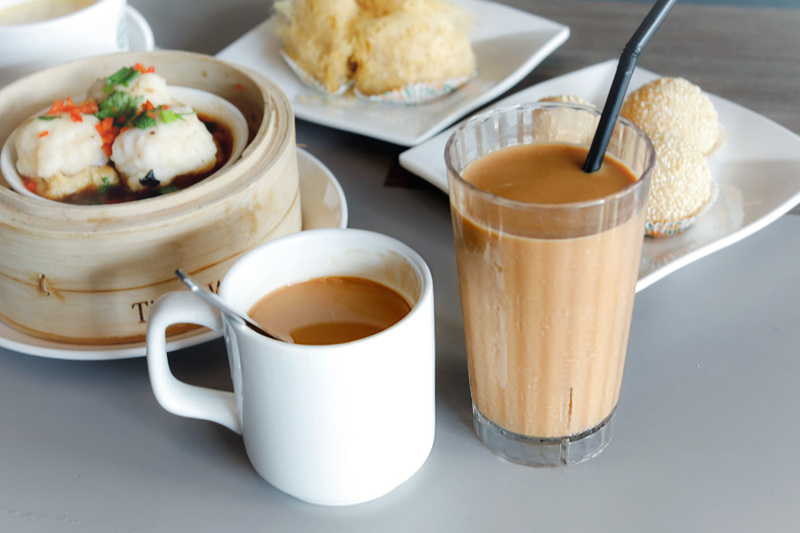 Finish well with a glass of strongly brewed black tea served Hong Kong style with condensed milk. A smooth, creamy and full-bodied beverage. Enjoy it as a part of your afternoon tea or even for dinner. 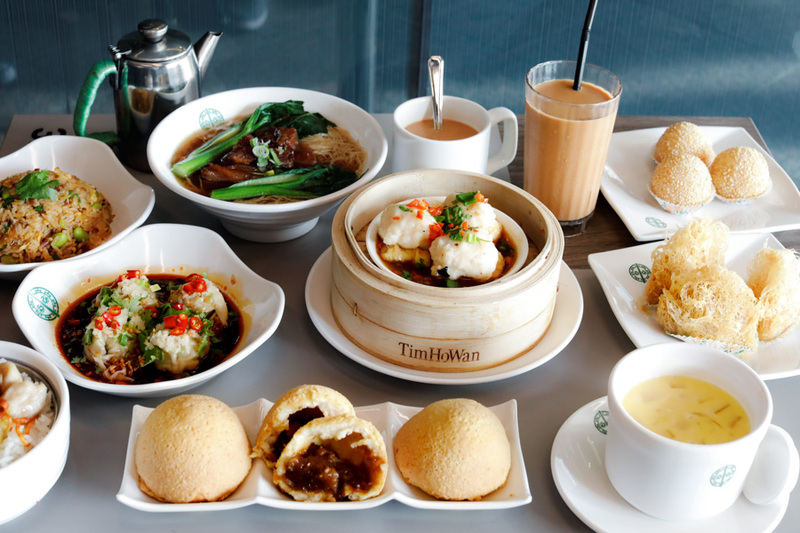 Other than the NEW items, Tim Ho Wan is known for its “Big 4 Heavenly Kings”: Steamed Egg Cake, Rice Rolls, Pan-Fried Carrot Cake, and Baked Bun with BBQ Pork. 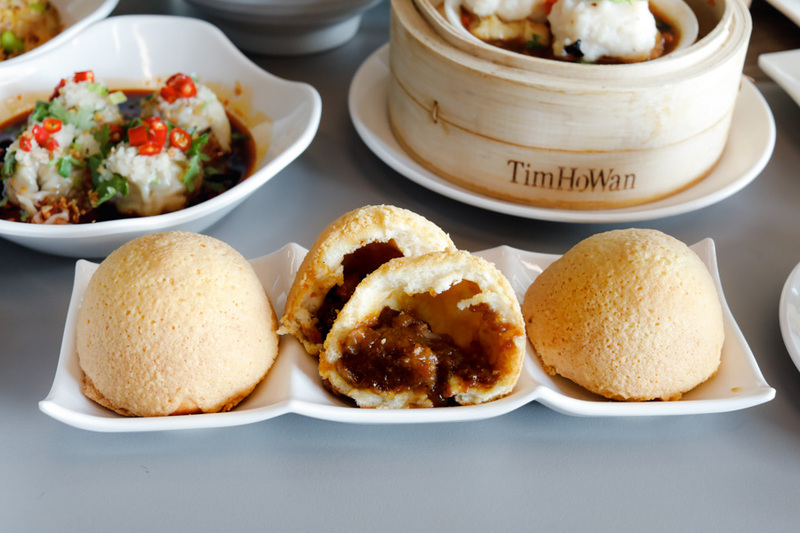 The Baked Bun with BBQ Pork is the must-try for first-timers, which has placed Tim Ho Wan on the global food map. 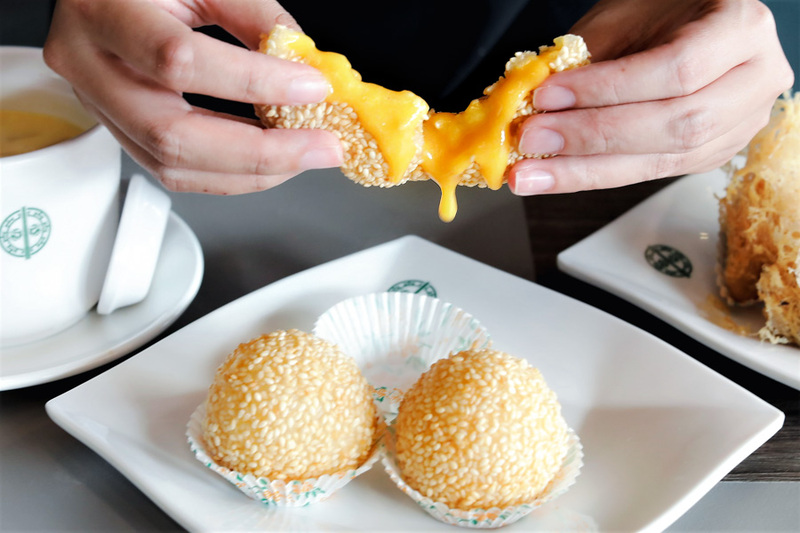 The pillowy-soft bun holds a saucy house-made filling, made with sweet but not cloying cubes of char siu blended in the signature Tim Ho Wan sauce. Sweet, crumbly dome, and served freshly baked. When you pry into a bun, wisps of steam will billow. 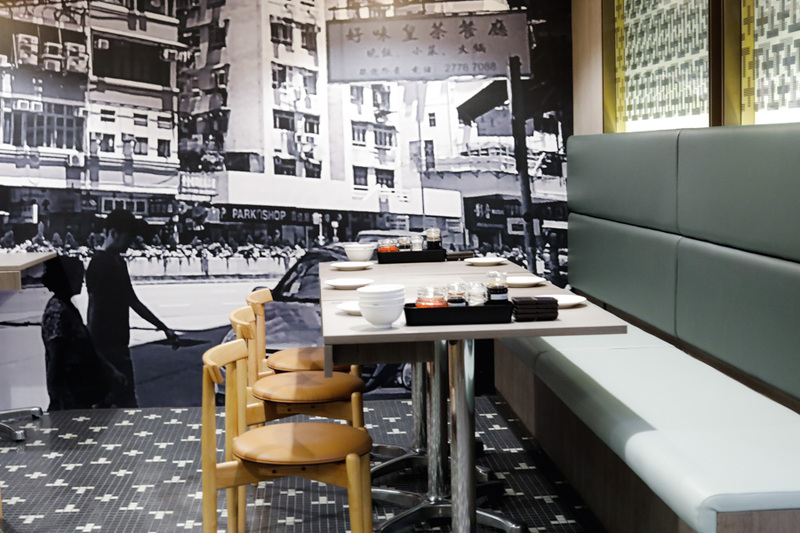 The Great World City Tim Ho Wan features an open concept kitchen built into the design scheme, while dim sum accented baskets adorn the walls. 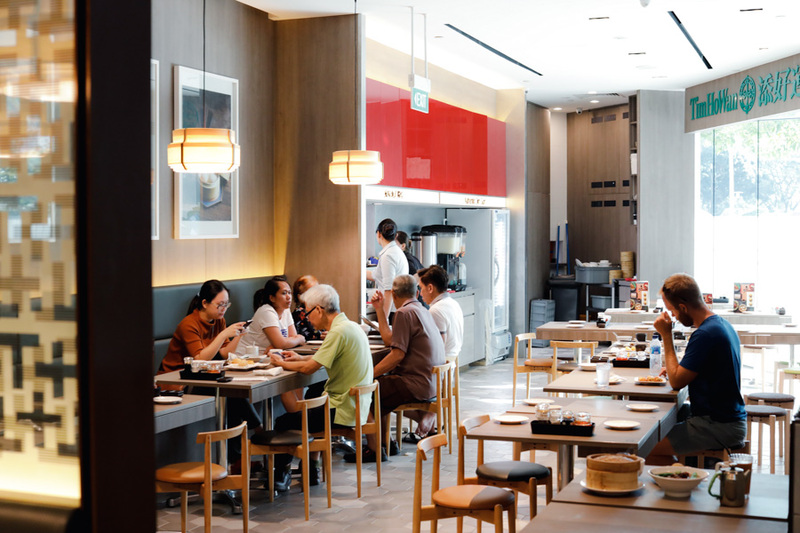 Both the interior décor and the food attempt to evoke and recreate the golden era of the old Silk Road teahouses where dim sum is said to have its origins. Time to head over for a family gathering. * This post is brought to you in partnership with Tim Ho Wan.